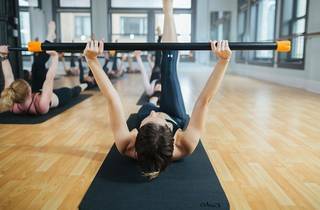 The most beautiful of the barre studios we visited is located in an airy sun-drenched space with great views of Downtown LA—the better to bathe their lithe, attractive students in flattering light. Owner/instructor Audra Skaates is an enthusiastic, super positive teacher, gently correcting students’ form while delivering encouraging mantras. Just leave extra time for parking and actually finding the place—it’s on the fourth floor of the Santa Fe building so you need to be buzzed in. Pricing: $25 for one class, $199 for 10-class pack; $159/month for unlimited classes. First class is $20; new clients can get one month of unlimited classes for $100.